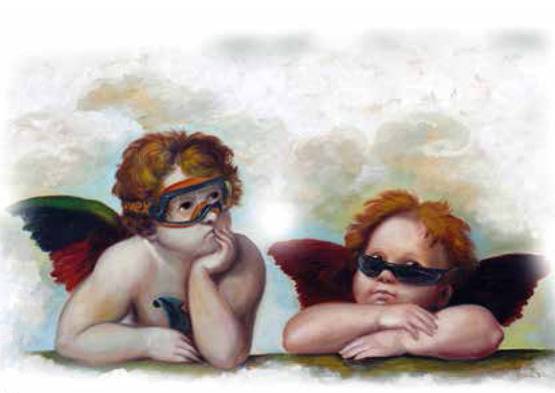 Do you have in mind those two iconic little angels (pondering and a bit chubby) that are basically everywhere on gift wrapping paper, frames, bookmarks, exercise books? We are pretty sure you are since they become the very first example of global product inspired by an art masterpiece. Well, maybe not everybody knows that they have been cut out from another Raffello’s masterpiece: the Sistine Madonna. The canvas, depicting the Virgin Mary with a child Jesus, was commissioned to Raffaello at the beginning of the 16th century for the church of San Sisto (Piacenza) where where it was displayed until 1574 (when Benedectine monks, under the pressure of huge debts, were obliged to sell it to August III the Saxon). August III flaunted this large-sized artwork (2×2,7m) in his enormous collection in Dresda and it persuaded eminent and prestigious writers, poets and philosophers to come to pay a visit ( Goethe, Hegel, Novalis, Dostoevskij, Puskin, Schopenhauer, Bulgakov, Grossman and so on). 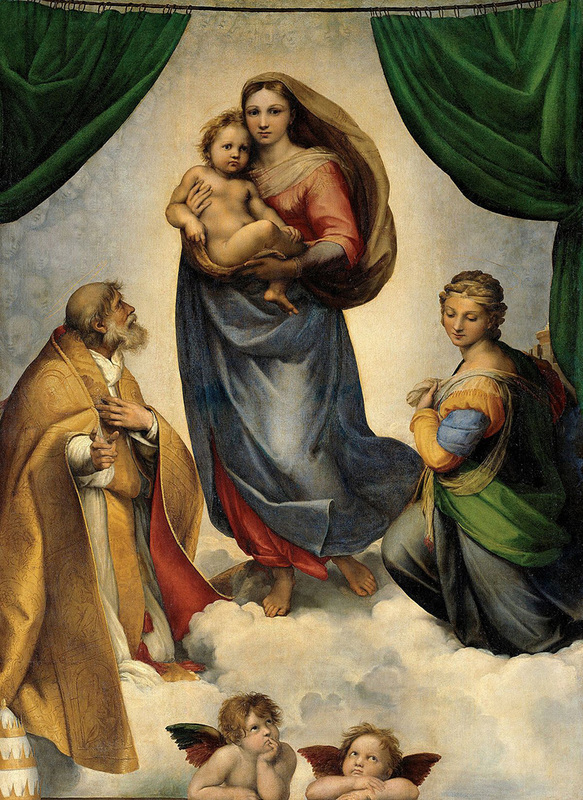 Artists such Heidegger, Freud and Andy Warhol showed a vivid interest for the Sistine Madonna. Right now the canvas is safely preserved in the Gemaldegalerie Alte Meister of Dresda (since in the aftermath of the Second World War, it was smuggled and brought to Russia for over 10 years). And since the 19th centuries on, these two puffy and cheerful little angels, have been reproduced independently of the main painting. Let’s try to imagine, once he finished his painting, Raffaello steps back from his masterpiece to have an overall view and he decides to add up two little angels among us on Earth and Heaven, beyond the window. Who are those angels? And how come they get there? Most importantly, why do they now wear glasses? We tried to imagine these two sweet angels as wayward children, two orphans who likes doing any kind of shenanigans.. Joyful, merry and incredibly cunning, they were fooling around the streets of Dresda until they got hired to working at the silver-mines of Freiberg. They very soon became the mascot of the miners but a gloomy day they disappeared while they were recklessly playing hide-and-seek through the small mine’s tunnels and they were never found back.. So Saint Barbara, patron saint of miners, mountaineers, geologists and of those who suddenly disappear, showed them her mercy and she brought them secretly in Heaven. She left them on the windowsill looking over the earth, where, as you may see in the painting, she looks tenderly after them. And here they are, like real guardians nosing around the two worlds. Once looking up at Heaven with all the Saints and Divine creatures; then turning their look downwards to the busy people whose likewise peek out the windows to figure out what is waiting for them on the outside.. Unluckily, this very simple activity endangered Stefan and Michael’s sight. On one side, the blinding light of Saint’s Halo and the radiant stardust of Paradise and, on the other hand, the atmospheric dust and lousy pollution irritated increasingly their smart and a bit blue eyes. At this point, Saint Barbara showed up in Marco’s dreams and she gave him a great tip: let them put some safety glasses on! <<But just the very best!>> she pointed out. Maybe -but we can’t scream it aloud, since it would be unfair business practice – she suggested the brand too: Uvex. In the end, Marco painted Sportstyle’s glasses and the <<U-Sonic>> mask on the mischievous face of Stephan and Michael. They nodded happily to her patron Saint and they become the <<four-eyed little angels>>.